Hasan Palaz, the former vice president of the Scientific and Technological Research Council of Turkey (TÜBİTAK) who is allegedly affiliated with the Gülen Movement, has been detained after an arrest warrant was issued for him on Monday as part of the investigation into wiretapping the office of President Recep Tayyip Erdoğan during his tenure as prime minister. Palaz is among the 13 suspects who face charges of conducting organized spying activities after being accused of taking part in bugging Erdoğan’s office, a discovery made in 2012. Palaz was previously taken into custody under the scope of the investigation and later released. He has now been detained again along with two other suspects in Istanbul and will be sent to the Ankara Police Department’s counterterrorism unit. Palaz’s lawyer said his detention was pertaining to the bugging report, which the Ankara Chief Public Prosecutor’s Office that looked into the offense claimed was fabricated. The Ankara Chief Public Prosecutor’s Office launched an investigation into the incident after Erdoğan revealed in late 2012 that a listening device had been found in his office and lawsuits were filed against the suspects at the Ankara 7th High Criminal Court. In addition to Palaz, among the suspects are police officers Ali Özdoğan, Serhat Demir, Sedat Zavar, Ahmet Turer, Enes Çiğci, İlker Usta, Hurşit Gölbaşı, Seyit Saydam, İbrahim Sari, Mehmet Yüksel, Zeki Bulut and Harun Yavuz. Özdoğan, Zavar, Turer, Çiğci and Usta were also charged with political espionage, violating private life and recording speeches. The suspects are allegedly affiliated with the Gülen Movement, which is accused of carrying out illegal wiretapping activities in an alleged attempt to oust the elected government. Palaz was previously asked to observe over the bugs that were placed in the office to spot the timing of the wiretapping and how long it lasted. 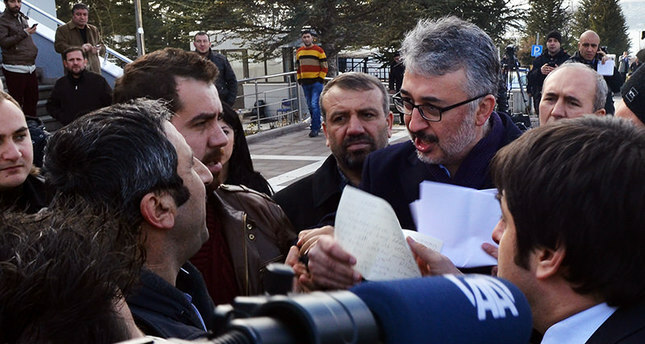 Palaz reportedly assigned Gökhan Vıcıl and Hamza Turhan for the task and it was later discovered that assessments reported in the document were false and the report was fabricated, which fueled doubts that the suspects were trying to protect the members of the Gülen Movement to avoid charges against them. It was also claimed that Turhan and Vıcıl, who were tasked with preparing the report, did not have the expertise to carry out the task. The two suspects in question were detained along with Palaz on Monday for the alleged fabricated report. There were also allegations that scores of people were assigned to TÜBİTAK with fake diplomas at the time Palaz was vice president of the body. The arrest warrant for Palaz, Turhan and Vıcıl has come after two other suspects in the investigation, Zavar and Usta, who fled to Romania to avoid the charges, were extradited from Romania. There have been many charges targeting members of the Gülen Movement since their alleged attempt to oust the government became public with the operations they purportedly carried out on Dec. 17 and Dec. 25. They have been accused of trying to topple the elected government by exploiting their authority in key government institutions such as the judiciary, Presidency of Telecommunications and the police, which they had allegedly infiltrated concealing their loyalty to the movement. The suspects are accused of eavesdropping on top officials and of disclosing information of a highly sensitive nature as well as “forming an organization to commit a crime and being a member of this organization,” “violating privacy,” “illegally seizing personal information” and “forging official documents.” Prosecutors are seeking 21 years to 36 years in prison for the suspects. Erdoğan revealed in late 2012 that a listening device had been found in his office and charges of political spying were brought against 13 suspects. The Gülen Movement, led by Fethullah Gülen, has over 140 private schools and charity organizations around the world including the U.S., Europe, Asia and Africa. It has been accused of infiltrating state institutions to gain control of state mechanisms, illegal wiretapping, forgery of official documents and spying.